The regulatory world surrounding development projects can be complex, but we have the skills and experience to streamline review and achieve creative changes to historic properties. Re-imagining the Ford Factory sparked a collaboration under CEQA to rehabilitate a Beaux-Arts daylight factory where Model T's were assembled. Today, the Ford Factory is an excellent commercial adaptive reuse that restores lost historic integrity while inspiring new creative work. Chattel prepared a Historic Resource Assessment and CEQA Impacts Analysis for rehabilitation of the 1914 Ford Motor Company Assembly Plant. Under CEQA, when a project is expected to cause substantial adverse change to a historical resource, environmental clearance for the project would require mitigation measures to reduce impacts. As the qualified historic architect, Chattel ensured the Ford Factory's continued conformance with the Secretary of the Interior's Standards through design collaboration and construction monitoring with owner Shorenstein and project architect Rockefeller Partners Architects. Thus, environmental impacts were reduced to a less than significant impact, and the Ford Factory came back to life with new creative office and retail space for tenant Warner Music Group. The Neon Museum Boneyard and Visitor Center celebrates Las Vegas' rich history through its signature art form - the neon sign. As consulting preservation architect for the project, Chattel is proud to play a role in preserving the city's colorful history. Chattel managed implementation of National Scenic Byways Program grant funding and worked closely with the Nevada State Historic Preservation Office, Federal Highway Administration, and Nevada Department of Transportation. The project, which involved Section 106 environmental review and local certificate of appropriateness review, encompassed rehabilitation of and an addition to the iconic Paul Revere Williams-designed La Concha Motel lobby, which now houses the Visitor Center. The Neon Museum Boneyard is home to over 150 neon signs. La Concha Motel Lobby disassembled at donor site. The rehabilitated La Concha Motel Lobby is the new Visitor Center at the Neon Museum Boneyard. Chattel is preparing a Preservation Plan that will allow the campus as a whole, including buildings and landscape, to continue serving as a symbol of the federal government’s commitment to care for veterans. Chattel is assisting in seismic retrofit and limited rehabilitation of 14 buildings at the Veterans Affairs West Los Angeles Medical Center (VA West LA). Collaborating with a team of architects and engineers, Chattel has completed Section 106 review for three buildings and consulted with SHPO, the Advisory Council on Historic Preservation, Los Angeles Conservancy, Veterans Service Organizations, and Native American tribes. In 2014, Chattel successfully completed a National Register nomination for the campus and full rehabilitation of Building 209, which is scheduled to open in 2015. The National Register-listed historic district includes 48 contributing resources and 38 non-contributing resources, including Building 209. Buildings designed in a Mission Revival style, reflecting a romantic California past, serve to honor veterans though a recognizably "American" or patriotic language of architecture. The campus, located at the prominent intersection of Sepulveda and Wilshire boulevards, developed in response to changing health requirements and numbers of veterans and includes large, landscaped grounds that have been enjoyed by veterans, their families, and other visitors. Photo courtesy of Department of Veterans Affairs archives. Affectionately known as “Queen of the Missions,” Mission Santa Barbara was established in 1786 and is a National Historic Landmark. The National Park Service provided a Save America’s Treasures grant including a match for a total of $1.3 million for various preservation projects. Chattel was engaged to prioritize and manage implementation of grant projects. Chattel prepared a Historic Structure Report (HSR) as a comprehensive guide to long-term preservation planning for the Mission and its convento wing. The HSR provides relevant historical background and addresses feasibility of implementing grant projects. For high-priority projects, Chattel prepares treatment plans and bid packages, collaborating with a cost estimator to ensure projects can be accomplished with available grant funds. Chattel works closely with Mission leadership and the California Missions Foundation, as well as the California Office of Historic Preservation and National Park Service to ensure projects conform with the Secretary's Standards. Chattel oversaw repairs to the corroded structural members of the crypt below the church floor. Work included reconstruction of the solstice window on the 1820 church facade. Ongoing work includes repairs to sandstone walls of the convento wing at the Mission. Deterioration is caused by an impermeable Portland cement render, which traps moisture in the underlying materials. Similarly, the impermeable tile floor prohibits water from evaporating. Thus, moisture escapes where it can, which in this case is at the sandstone door and window surrounds. The rehabilitated Boyle Hotel demonstrates a successful effort to bring much needed affordable housing to Boyle Heights while at the same time restoring a beloved icon to its former glory. Today the Boyle Hotel is a legacy for the local community and an important link to its past. Chattel worked with East Los Angeles Community Corporation (ELACC) and architect Richard Barron to restore the building’s distinctive corner cupola, rehabilitate 30 affordable units in the historic building and add 21 units in a new addition. The project received a National Preservation Honor Award from the National Trust for Historic Preservation and a Los Angeles Conservancy Preservation Award in 2013. New affordable housing for mariachis, who congregate daily in the nearby Mariachi Plaza waiting to be hired. The 4,150 square feet of retail space includes a Mariachi Cultural Center. When constructed in 1889 by George Cummings, the Boyle Hotel reflected expansion and growth outside Los Angeles' commercial core. 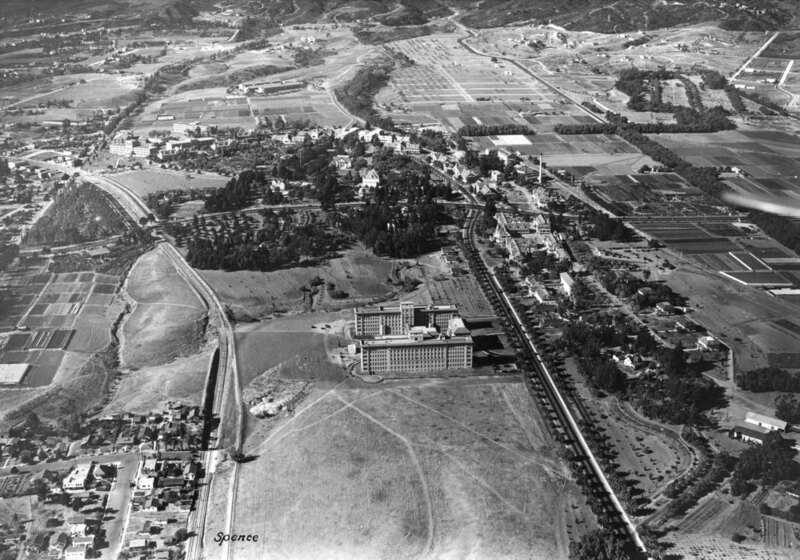 The building represents a transition at the end of the nineteenth century when Los Angeles went from a town surrounded by farmland to a burgeoning city center surrounded by suburban neighborhoods. Photo courtesy of California State Library.